A Gingerbread house was created to share, Pippa received everything she wished for, we have more ways of creating family fun, the Reindeer got up to mischief in the back yard again, Christmas Lunch was shared with family and Pippa’s gifts to us were the most incredible precious treasures ever………. We have been receiving parcels which is always exciting, some very cute named Christmas stockings are hanging in our lounge room and a magical Christmas tree stands elegantly enticing endless comments from people who see it. 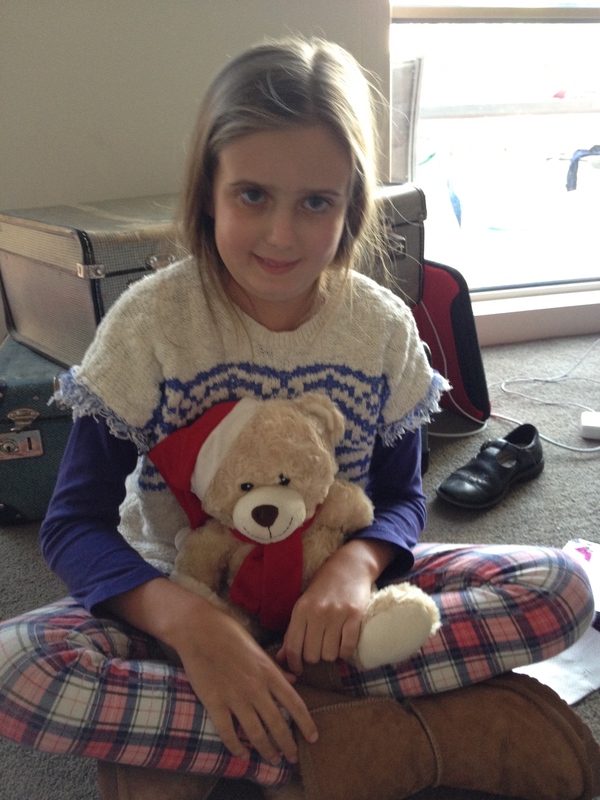 On Friday Pippa received another parcel and opened it. Inside was a Christmas Teddy Bear. She aptly named him Santa’s Little Helper or ‘SLH’ for short. Geoffrey, Henry, Monkey and Harold have been carefully put aside to be re-cuddled after Christmas. SLH has constantly been with Pippa since Friday and with him he has brought a little Christmas Hope and his own little magic………. Until Friday Pippa was focussed only on Christmas for everyone else: She had delivered little gifts for her classmates, friends, family and the u18s basketball team. Christmas shopping started on the day of our Christmas Sights Visit in Melbourne when she purchased her first of three gifts for James and Patrick. There are mysterious presents abound under the tree with “Love From Pippa” and by Friday she was completely organised ensuring that everyone around her would have a special Christmas from her. Then Santa’s Little Helper came in the mail. All day Friday she clung to him. Saturday morning she woke excited. At first I thought she was excited because we had decided we were able to go to our annual extended family Christmas gathering in Anglesea. She was but that wasn’t what she was initially excited about. Pippa needed to get ready for her Christmas. She needed to write her Santa list. Santa was coming in 4 sleeps and it needed to be done. That very minute! The list was typed carefully on the computer, printed, laminated, hole punched, placed in a folder and left under our Christmas Tree. Yes, she’s her mother’s daughter; it was categorised and spaced out perfectly, but just shy of being put on an excel spreadsheet! Only then could we leave for Anglesea – “Dougfest” would be 24 hours of fun with cousins, plenty of food, gifts, our annual raffle and a larrikin Santa handing out presents……… When we arrived Pippa was asked by Chelsea-Lee’s beautiful little face gazing up at her if would please go on the trampoline with her? Pippa said, no she wasn’t going to be able to go on the trampoline today. Later on in the afternoon though she was adamant she was going on the flying fox – and fly she did! Complete with a merry band of followers! Santa gets a bit hot under his beard sometimes! We returned home to find that not only had Santa been to collect her list, but he had also left her 2 bracelets with magical powers made especially for her by his Elves! Indeed, the magic of Christmas started to spread and Pippa’s face began to beam at the thought of Christmas Eve and Christmas Day. We have done our annual Wishing Tree Shopping from the raffle James started 8 years ago……. Two weeks ago Christmas Day could not come quickly enough. Now Pippa seems a little bit stable, I am continuing to slowly and carefully drop her steroids and 2 days out Christmas is finally within our reach. Pippa and I have talked this week about how happiness can come from bringing joy to others – at Christmas time this is an easy discussion to illustrate and have with Pippa – she has been busy ‘bagging & tagging’ some little gifts this week to help bring a little joy to her classmates, friends and family. Yesterday joy was brought to Pippa. A very kind and generous supporter of the RCD Fund offered to fly Liz & Celia down for lunch and a visit. Wow! The result of that was Pippa got to fly in a helicopter and Liz and Celia got to have lunch at our place and meet Nibbles in the flesh, or rather, fur! The helicopter ride was put on her happy list the night before along with going to school and seeing Jeff’s husky. We hadn’t really told anyone what was happening but as Pippa’s class wondered why we were leaving school at 10.30 instead of our usual 11.30 I asked her if she wanted to let them know. I am so glad we did! We went home for Pippa to have a quick rest before Liz and Celia arrived. They were early – how I wish it only took me 60 minutes to get from Melbourne to Warrnambool! The excitement intensified as we spotted the helicopter buzzing ahead of us as we were driving down to the beach – they didn’t have to wait for traffic lights! Special arrangements had been made and the helicopter landed on a grassed area along the foreshore. Pippa, Liz and I went up first and did a flight along the coast and river before turning around to do a fly over Pippa’s school. Pippa was excited. From the distance she could see everyone gathered on the oval. She eagerly gave directions to Mark, “the blue patch over there on the grass is all my school friends!” What she saw was not only her whole school waving, but one class lying down spelling out her name! Very clever, very thoughtful and completely lifting the bar on the excitement level. We could see everyone waving and jumping around watching us as we flew by. She was thrilled and we looped around a second time for another look at her name. If only we had a horn to toot!!! A few friends dropped over briefly after school which was terrific – it meant that not only could Pippa relive the excitement of the flight, but she also heard about how much her school mates enjoyed being a part of it as well. They looked at photos and one friend successfully found himself in one of my photos – that in itself was fun. We woke up this morning and she again relived the moment via the front page of the newspaper sitting up in bed reading the article. It was not so much a wish of Pippa’s that was granted; it was simply the extraordinary generosity of a man who didn’t even know us to fly Liz from Melbourne and do something memorable for a little girl. The added bonus of her thoughtful school community was the icing on the cake making it even more special and personal. Pippa insisted that Liz be in the helicopter with her and me – I am so glad Liz was there to witness Pippa’s reaction as we flew over her school. As for what was on our Happy List for today……..it was going to the movies to watch Alexander and the Terrible, Horrible, No Good, Very Bad Day. Such a lovely and fun movie to watch. Perfect for today. On Pippa’s list of important things one simple word stood out loud and clear – Happy. Being happy, feeling happy, having happy days. With that in mind, we now have a special nightly routine at bed time. Whilst waiting for me to heat up her “snuggle sacks” (two to keep her feet warm and one to feel cosy on her tummy) and organise medication, eye drops and eye gel, Pippa types up a list of what is happening the next day that will make it a “Happy Day”. We then read through it together. Usually it is some quite simple things: wrapping Christmas gifts, decorating the Christmas tree, going to school for a couple of hours, seeing a friend or a cousin. Even having only one or two things on her list, I explained, could make a day happy – we don’t have to have full days, we just need to enjoy something each day. So far this week each day has been happy for Pippa and somedays surprises have happened or something unexpected has occurred that has added to her happiness. Some happy times for Pippa……. Lucky we popped into the staff room! Of course we could focus on all the negative issues at hand, but when you have to live one day at a time, focussing on happiness is a great way to do it: ending a happy day happily thinking about the happiness that lies in store the next.